From Baltra, a quick jump by ship brings us to Mosquera Islet where we check out the sea lions before sailing towards San Cristobal. A stop at the Cerro Colorado Tortoise Breeding Centre will open our eyes to the beauty of the Galapagos giant tortoise and to the important scientific work that continues to be performed on the islands. In the afternoon, we travel to the most eastern tip of the archipelago, Punta Pitt, the only stop on this journey where we can see red-footed boobies. 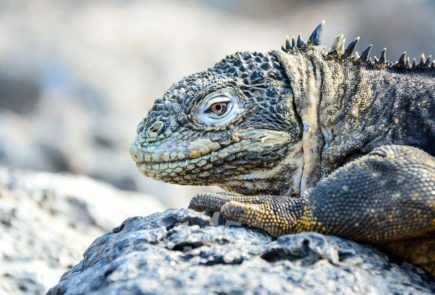 From here, it’s on to the central islands, starting with Santa Fe, with its beautiful tranquil bay, before continuing to the wild cliffs of South Plaza with their lofty cacti, land iguanas and stunning marine birds. The following day we visit the world-famous Charles Darwin Research Station on Santa Cruz Island. 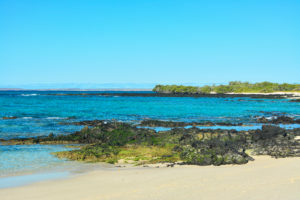 Española Island, voted the #1 island by guides and expedition leaders, awaits us with its remarkable visitor site of Punta Suarez, home to hundreds of marine iguanas, sea lions, marine birds, and even albatross (between April and December) – a truly stunning site! In the afternoon, we enjoy the water in Gardner Bay. The following morning we will wake up at Eden Islet and finish the day at North Seymour, famous for its land iguanas and sea lions as well as bird colonies of blue-footed boobies, frigatebirds, and Nazca boobies. We finish at Baltra after a moving and memorable experience. Important Note: The Santa Cruz II operates on a 15-day cycle (to cover each separate region of the archipelago), meaning that not all Fridays of the year will serve as departure dates for this specific itinerary. Please refer to our Sailing Dates table for exact departure dates for Fridays of the year. *This itinerary departs every second Friday. If a Friday does not appear in the list below, it is either because we are fully booked for that Friday departure period or simply because we do not operate this specific itinerary on that Friday departure period due to our 15-day sailing cycle (to cover each separate region of the archipelago). *Due to the remote location, Internet connections are intermittent and low-bandwidth. Itineraries for reference only. Our routes and programmes may vary according to National Park policies and regulations, weather conditions, seasonal changes, safety and operational reasons, and wildlife viewing opportunities. Please remember that the exact route and programme may vary according to weather and ocean conditions and the wildlife we encounter. It’s also subject to change without previous notice due mainly to readjustment of the National Park policies and regulations. Dry landing: guests step from the panga (dinghy) onto rocks or a dock. **At your request, we can include the Galapagos National Park entrance fee of US$ 100 and migration control card fee of US$ 20 (subject to change). However, please note that, due to administrative and operational reasons, these fees can only be included when guests travel on the operation departure date. This service does not apply for guests who travel before a departure date (even if the departure is with us). *** Please note, we charge guests who wish to bring bottles of wine and/or spirits aboard our vessels a corkage fee of US$ 25+taxes. 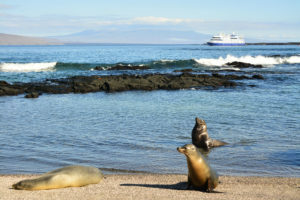 **** Internet connections onboard consist in computer stations and wifi in the vessel’s social areas; due to the Galapagos’ remote location, internet connections are intermittent and low-bandwidth. I just returned from a 7 day 6 night Eastern Island trip on the Santa Cruise. The ship is in excellent shape. The rooms are nice size and very clean. I had a shower that dripped after I was there two days and the complete faucet was replaced within an hour. I can’t say enough about the crew, Janeth, Robert, Flex, Eddy, the Captain, just everyone was incredibly nice and accommodating at everything. Great tours and in every language. The food, second to none of the lager cruise ships I’ve been on. Just a great experience. From the time you land in the Galapagos, until wheels up, this company is there to make sure everything goes right!! Kenneth! We’re absolutely delighted and proud to hear that you had a wonderful time aboard our Santa Cruz II! Thank you so much for writing and letting us know how much of a good time you had! We hope to see you again in the near future. Warm regards, the Metropolitan Touring Team.